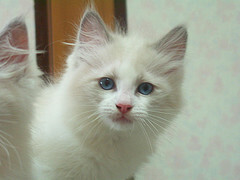 An experienced Californian breeder and feline lover named Ann Baker developed the rag doll cats breed in the mid-1960s. Ann Baker is credited with setting the standard look and temperament for the Rag doll breed. Breeders Denny and Laura Dayton, on the other hand are said to be responsible for bringing the breed to international recognition. These two breeders where in direct competition with each other and did not see eye to eye on what direction the breed should head in. Some people say that the competition was helpful and healthy for the breed as it widened the gene pool going forward. In part due to the two factions developing different takes on the breed as in colors and temperaments that still exist in today’s generations. Despite its deserved reputation for being a very calm, docile breed this cat is also a large and impressive feline. This animal is stocky in build with heavy bone structure. Males can weigh from 15 to 20 pounds and females from 10 to 15 pounds and a typical male may reach a height of 18 inches. In general appearance rag doll cats are similar to a Berman. They are broad across the shoulders and across the hindquarters with a very deep chest. The legs are medium in length and sturdy with large round firm pause Tuft between the toes. The tale is long and brushed medium to thick at the base with a slight taper towards the back of the tale. 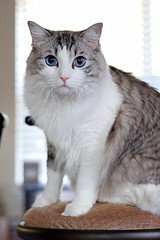 The head of the rag doll cat is large with full cheeks and a rounded muzzle on a short thick neck. The ears should be medium sized at the base and rounded at the tip. The coat is semi-long, very full and silky with prominent longer hair on the chest and stomach. This animal has been recognized as a pedigree breed in the United States since the 1970s. This cat’s nature is one of unwillingness to fight or even protest. It is more likely to cower or hide. This docile nature makes it a good choice for a family with children and other pets. Its noncombatant nature also makes this feline a great choice for a strictly indoor pet. Avoid this breed if you want an outside cat, because they can be to trusting of other people and animals. This could lead to injury of the animal. Also the heavy coat can lead to overheating in summer and cleaning the fur is difficult. Speaking of grooming in the summer when the animal sheds heavily it can be demanding to keep the coat nice even with a furminator. The dense coat tends to knot and tangle and should be combed out and then brushed frequently. A little known fact about this breed is the kittens are born white and do not achieve full color or size for two to three years. These cat’s are bred in four-color points, as well as in bi-color and mittened varieties. In the seal point the body color should be a pale fawn shading to a pale cream on the under parts. The points are a deep seal brown. The nose area is a dark brown and the paw pads are dark brown or black. The chocolate point has an ivory body coat with warm chocolate points and pink nose and pink paw pads. The blue points, body color is gray to bluish shading to lighter bluish on the under side. The points are deep blue gray as are the nose and the paw pads. 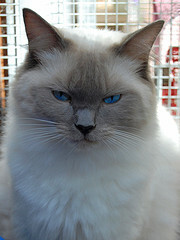 The mittened variety is considered by some rag doll cat breeders to be the original and only acceptable version of the breed. This has a white chest, bib and chin with a white stripe running from between the four legs to the base of the tale. They should be evenly matched white mittens on the front paws and boots on the hind legs.